Brief updates will be posted below on the light snow event currently affecting the region. Yesterday’s forecast discussion for this and the following storms can be found here. 2:30 PM: Over the last 2 hours, widespread moderate snow spread into northern NJ and NYC, with light snow falling elsewhere. Temperatures have slightly cooled down due to the precipitation, remaining unseasonably chilly for a mid March afternoon with temperatures in the mid 30s in northern NJ/SE NY and upper 30s further east. The snow is sticking to mostly non-paved surfaces in northern NJ under the moderate band. Snow is expected to continue falling through this evening, with accumulations in northern NJ from a coating to 2 inches mostly on non-paved surfaces. Other parts of the area are expected to see light snow with minimal accumulations. Chilly temperatures are expected again for Sunday, but the break between storms won’t last long until the next storm affects the area on Monday with more accumulating snow expected as the winter-like pattern continues. 12:15 PM: As of 12 PM, the area is mainly cloudy with isolated rain/snow showers for some locations. A narrow band of moderate to heavy snow is located over the I-80 corridor over central Pennsylvania, spreading east/ESE. This precipitation is expected to begin drying up as it reaches the area, but still looks to be capable of supporting a narrow band of moderate snow reaching the area starting at about 2 PM and through the evening hours. The focus of this narrow band of moderate snow looks to be around the I-80 and I-76 corridors in northern NJ, possibly into New York City and parts of western Long Island, with light snow showers elsewhere. Under this band, a coating to 2 inches of snow can be expected, with the highest totals further west in New Jersey, with no accumulations expected in NYC. Other parts of the area will see scattered snow showers, mixing with rain for eastern areas, with little to no accumulations. Due to the cloud cover and precipitation, temperatures will remain chilly today, only peaking in the upper 30s to low 40s across most of the area. 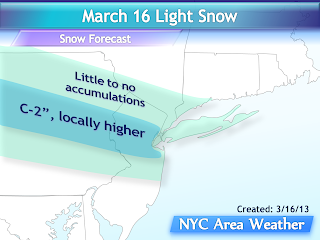 Below is a snow map for today’s snow. This map mostly focuses on the placement of the moderate snow band with less emphasis on the exact specifics of the snow placement and accumulations; there will likely be some accumulations outside of the darker blue zone, with snow flurries also falling outside of the highlighted light blue area as well.